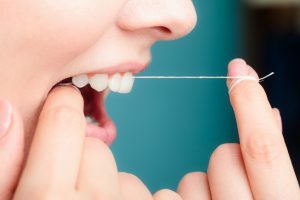 Why Is Flossing Important For Your Dental Health? When life is rushing by, it can seem like a completely innocent thing to forget to floss on occasion. When you brush twice a day, such a small part of your daily routine can’t really be that important, can it? Unfortunately, your dental health is often directly related to your physical health in a wide range of conditions. Here’s why flossing is such an important part of your dental health regimen. Let’s start by looking at how brushing and flossing are different. Brushing takes care of the front, back, and chewing surfaces of your teeth. However, that still leaves the sides of your teeth to be cleaned. To reach these areas, most people floss once or twice a day to ensure these areas remain clean and free of cavities. If you don’t floss, these areas aren’t cleaned and cavities may form. As these cavities begin to grow larger, they become a refuge for more cavity-forming bacteria, spreading to the neighboring tooth and causing a second cavity on that tooth. But, that’s just a few cavities, right? Unfortunately, that’s not the end of the story. It also causes irritation in the gums, a condition called gingivitis. This can lead to periodontal disease, mouth infections, and tooth loss. Poor dental health impacts other areas of your body. Gum disease increases your chances of developing heart problems, strokes, Alzheimer’s disease, and system-wide inflammation. It can worsen the effects of diseases, such as chronic obstructive pulmonary disease, rheumatoid arthritis, and pneumonia. Fully 95 percent of U.S. adults who have diabetes suffer from periodontal disease with one third of those having suffered tooth loss, due to the increased risk of infection in diabetes patients. Patients with diabetes and periodontal disease also have a harder time controlling blood sugar levels, creating a downward spiral of complications from both diseases. It also impacts fertility. On average, women without gum disease conceived in five months, compared to seven months in mothers with gum disease in a European study. Combined with a seven times higher rate of erectile dysfunction in men with periodontal disease, these factors make getting pregnant difficult. But, what about babies before their teeth have erupted? Pregnant women have a weakened immune system, making them susceptible to infections. Combined with poor dental care, this can lead to an infection causing premature birth, proven in a study in the American Journal of Obstetrics & Gynecology, which showed a relationship between better dental health and decreased prematurity rates. When you take good care of your teeth, you’ll enjoy better dental health, and flossing is an important part of your care regimen. But, if you’re experiencing pain or need to have your teeth checked out, we’re always happy to help. Please feel free to contact us today to schedule an appointment so you can enjoy good dental health.